What Is ISBN And Do You Really Need One If You Self-Publish? 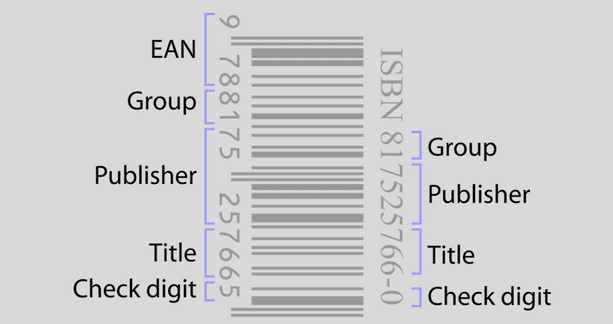 The bar code or ISBN number you see on the copyright page and the back of books printed by a publisher is a unique identifier. All published books require a separate ISBN to identify the publisher and the title. The numbering systems give enough information about a book to make each one a unique ISBN. The Group, Publisher prefix and Title numbers are easy to identify and understand. The last digit of the ISBN, the check digit, is used for error detection and the EAN is the European Article Number. From 1970 books have had a unique 10-digit ISBN, and then in 2007, the 13-digit number ISBN was added to overcome a perceived shortage of numbers in some parts of the world. The shortage hasn’t seemed to have eventuated though. Most books now have two ISBN numbers with 10 digits and 13 digits, which makes the ISBN system a little confusing. The only points to understand are that these numbers are essential to the supply chain for books. If you want to sell your book, you will need an assigned ISBN for every version. Every version means, paperback, hardcover, ebook and audiobook. How do you get an ISBN? Are free ISBNs a better choice? What’s the best option for ISBNs? You have two choices. Buy one, or get one for free. If you want to buy your own numbers, you will need to contact an international ISBN agency to get a national ISBN. In the United States, R. R. Bowker is the sole provider of ISBN numbers. Prices range from about US$125 for a single ISBN, but you can buy packages of 10 for around $295. Source Bowker. However, if you publish with Amazon, Smashwords, Draf2Digital or in fact, most self-publishing platforms, there is no charge for an ISBN. Let’s look at what happens if you buy ISBNs. The logical benefit of owning your ISBN number is that if you publish and make your book available on many retailers, your sales data will be cumulative. So if you are hoping to make it into the New York Times bestsellers, having your book sales divided up isn’t going to help at all. There is also a sense that you are in control because you can use the same ISBN on every publishing platform you use. All logical and it makes sense. Except that publishing platforms and online retailers don’t necessarily play the same game, especially when it comes to ebooks. On Amazon, you can’t use an ISBN because it uses an ASIN (Amazon Standard Identification Number) to identify Kindle ebooks. Also, some retailers such as Kobo and Tolino downstream to smaller retailers that do not support ISBN search. However, Apple and B&N Nook do support ISBN. But, Apple only supports the 13 digit number. So you can have an ISBN for most epub versions you publish, but sales from your biggest selling outlet, Amazon, won’t count because you can’t use your ISBN. Remembering that you need a separate ISBN for all your print versions and ebook versions, it can all become an expensive exercise. Lastly, if you buy an ISBN and apply it to an existing title, it will become a totally new book, and you will lose all your previous sales data. So forget about buying one if your book is already published. Well, yes. They are free which is one big plus. The biggest drawback is that you cannot transfer them between publishers and retailers. If you have published on Smashwords and used a free ISBN, you cannot use that ISBN to publish on Draft2Digital. The same with print books. If you publish with Lulu, you cannot transfer that ISBN to Createspace of KDP. When you check your Amazon Author page, there is a tab to check your NPD Bookscan data. With free ISBNs, you will be lucky to see much activity if your book is published under a few ISBN numbers. On the plus side though, free ISBN numbers are treated the same as paid by a search engine. Both Google and Bing use an ISBN database to return results for all books in print as well as ebooks and audiobooks. An ISBN identifies a book, so your book will be treated exactly the same as Harry Potter! If you want to be in control of your book publishing, and you can afford the considerable extra cost, you might think about buying an ISBN. Bear in mind though, that you will need one for every book version. So if you have a paperback, ebook and audiobook, it will cost a minimum of $300. If you have more than one title, the costs can add up very quickly. Also, if you have existing titles and change the ISBN, you will lose your book’s data and basically be starting from scratch with a new book. With a free ISBN number, there really are not a lot of issues that should concern most self-publishing authors. The only downside is that your book sales will not be calculated as a total across all retailers. But unless you are selling hundreds of print book copies a week, this will not be much of an issue. Well, unless you really think your book has a chance of getting into the national bestseller lists. There are more worthwhile expenses such as book covers, editing and book promotion that can help get book sales. An ISBN is certainly not going to do anything to help sell your book. In a way, ISBN numbers are a relic of a past time when books were only sold in bookstores as part of a tightly controlled market. The ebook and self-publishing have thrown a huge spanner into the works. It is impossible now to track every book and every sale, which was the case in 1970 when the ISBN was introduced. Yes, the number and bar code are still useful for making every book unique. But apart from that benefit, there is not much else. If you are selling mostly Kindle ebooks or getting an income from Kindle Unlimited, an ISBN is a total non-event. Amazon assigns an Amazon Standard Identification Number (ASIN) number to ebooks. For books in other formats, Amazon treats the 10-digit International Standard Book Number (ISBN), the ASIN and the ISBN as the same. If you sell print book copies on Amazon and Barnes & Noble, does it really matter what number is on the back of each copy? Self-publishers know that a large proportion of their ebook sales will come from Amazon. So why fret about a different number on the small percentage of sales that come from Apple, Nook and Kobo? In all honesty, I have never worried about what numbers or codes are on my books. I am never going to sell enough to threaten Ian Rankin or James Patterson, so why spend a lot of time and money on them. The only numbers that really count are dollars in the bank each month, and I have never considered that an ISBN number helps in this regard. But yes, ISBN numbers are still useful. Once again, the article is inaccurate. There is no obligation (probably has never been and most likely will never be) for the book to have ISBN. It’s helpful, it makes you look more ‘professional’, it opens new channels to you, but you are allowed to publish your titles without it. So no, they are NOT necessary. Sure, there is no need for an ISBN, but why wouldn’t you use one if it’s free. Hardly what I’d call an inaccuracy. There are multiple inaccuracies in this article. For example “On Amazon, you can’t use an ISBN” Yes you can. You can choose to let them assign an ASIN or use an ISBN you purchased. I won’t correct a few of the other inaccuracies but the editorial team of this site should do a better job of checking work before they let it go live.